Cori Simons rounds third with the tying run as a Masconomet outfielder chases a wild throw in the seventh inning. Brooke Jamison reaches second with the game winner after doubling to left in the bottom of the seventh. 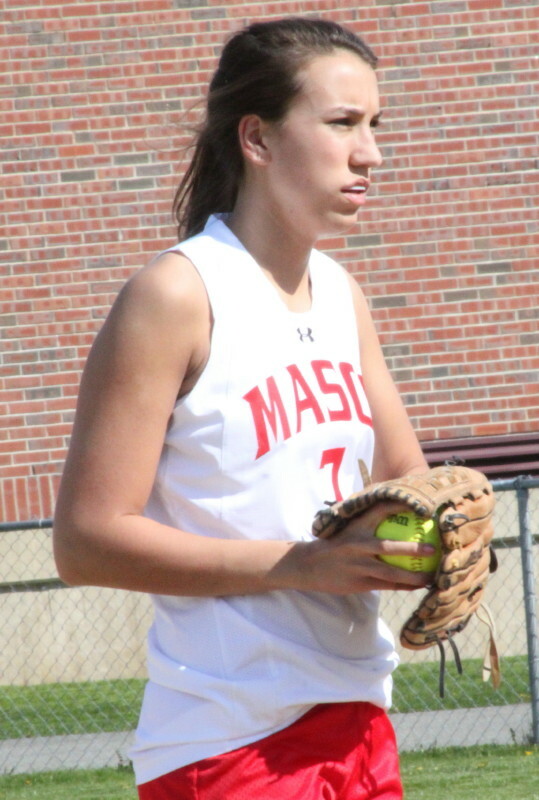 (Byfield) Costly errors by Masconomet (3-5) in the final two innings opened the door for the Triton (6-6) softball team to run its win streak to four with a 4-3 victory on Friday afternoon in Cape Ann League play. Brooke Jamison drove in the game-winner with a double in the bottom of the seventh inning. Triton didn’t get a hit until there were two outs in the sixth. Their first hit, however, was a double by Emily Jutras that drove in Kelsey Trudel. Kelsey had reached when Taylor Evans misplayed her grounder. 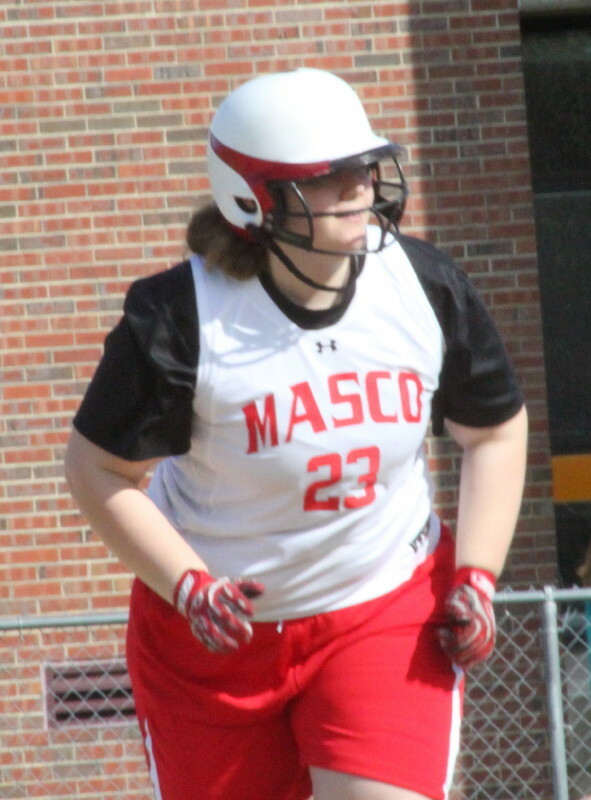 Both of Triton’s runs to this point were unearned but Masco still carried a 3-2 lead into the bottom of the seventh. Three Viking batters later the visitors had lost the game, 4-3. In the seventh, the first Triton batter Cori Simons lined a single to center. Second batter Kylie Gilroy pushed a bunt down the third base line. 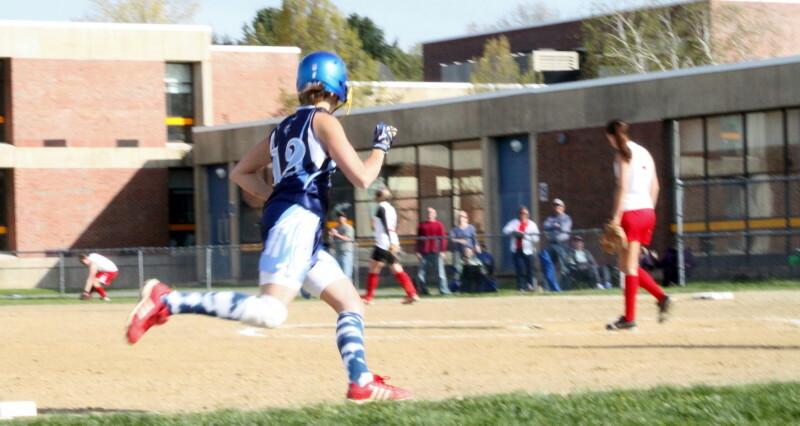 A hurried throw by 3B Julia O’Reilly sailed past 1B Kiki Brown down the right field line. Cori came all the way around to score the tying run while the speedy Kylie reached third. Third batter Brooke Jamison whacked a double to left to score Kylie with the game winner. For Masconomet (3-5) it was just another tough loss. They’ve lost five of their last six and each loss has been by two runs or less. That sort of thing gets old real fast! The Vikings’ first run (scored in the third) was one you had to see to believe. Leadoff batter Lily Anderson walked and Kylie Gilroy ran for her. Masco expected a bunt and for some reason, that escaped me, had every infielder except the first baseman in even with the pitcher. Off went Kylie from first on the second pitch. 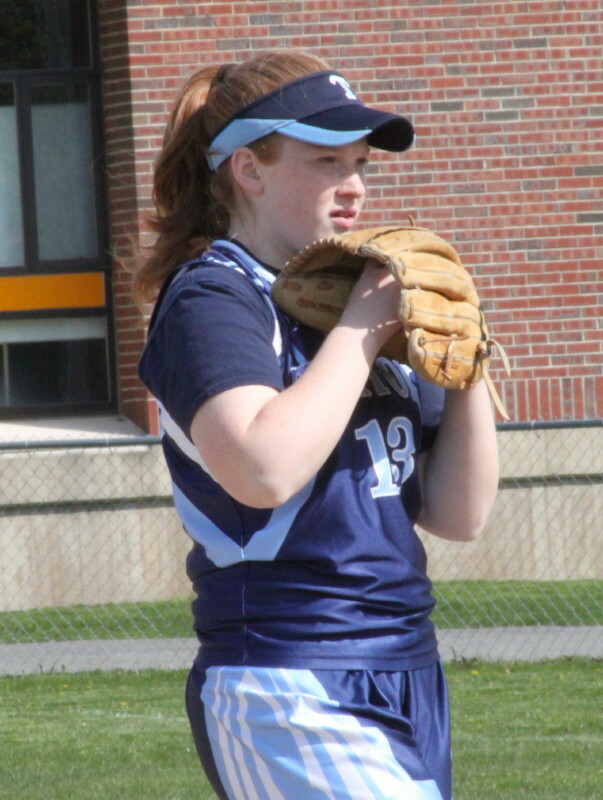 The only one around to cover second base was the Chieftain centerfielder, Samantha Martin. 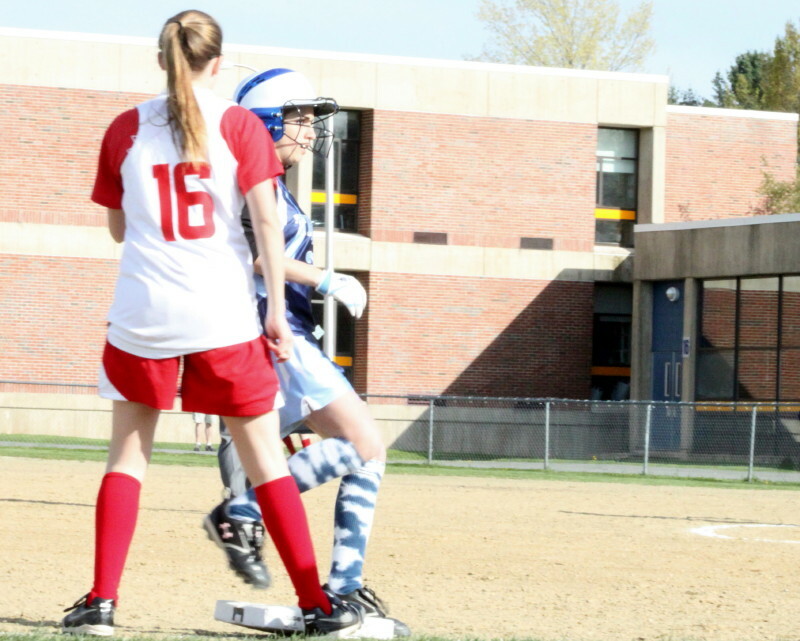 Catcher Shawna DiPietro’s throw sailed over Samantha’s head into center field and there was no one out there. Kylie came all the way around to score. Maybe the centerfielder was supposed to take the throw? Masco took the lead with a 2-run fourth. Two of Triton pitcher Marion Dullea’s four walks came that inning and were combined with hits by Shawna DiPietro and Molli Marshall. Molli’s single to left drove in one of the runs and a fielder’s choice by Shannon Beaton brought home the second. Masco would add a third run in the fifth. Samantha Martin singled to left and reached second on leftfielder Emily Jutras’ bobble. Lexie Corso delivered Samantha with a double to center. This gave Masco the 3-1 lead that evaporated in the final two innings. Chieftain pitcher Rachel Shamon deserved a better fate. She only struck out one batter but she had Triton hitting grounders (ten) all afternoon. All of the runs against her were the result of defensive problems by her teammates. Triton pitcher Marion Dullea had just one error behind her and that was in the outfield. She struck out three and also forced groundouts (eleven). 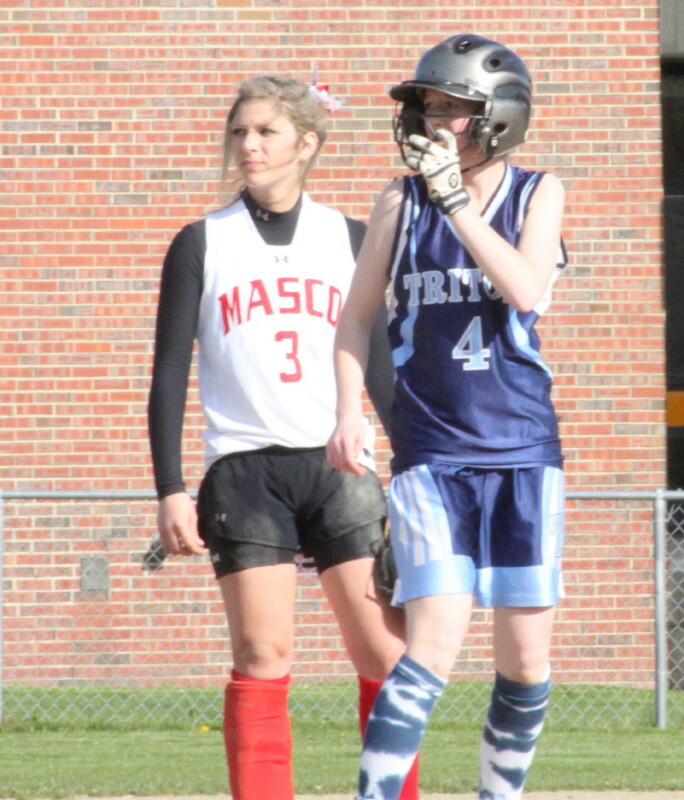 Masco defeated Triton 4-1 at Masco in the season opener in April. 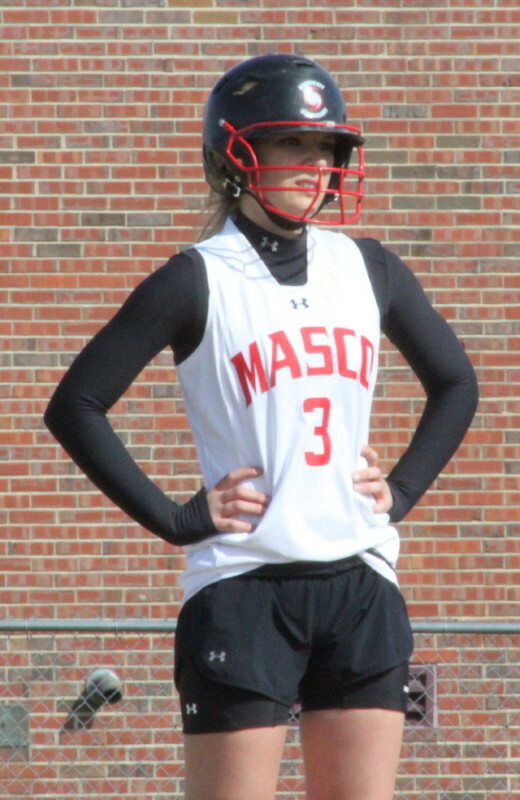 The pitcher for Masconomet that day (Lissa Rescigno) was sick for today’s game. Kylie Gilroy scored two runs for Triton. Her well-placed bunt in the bottom of the seventh inning had plenty to do with the hurried throw that followed. 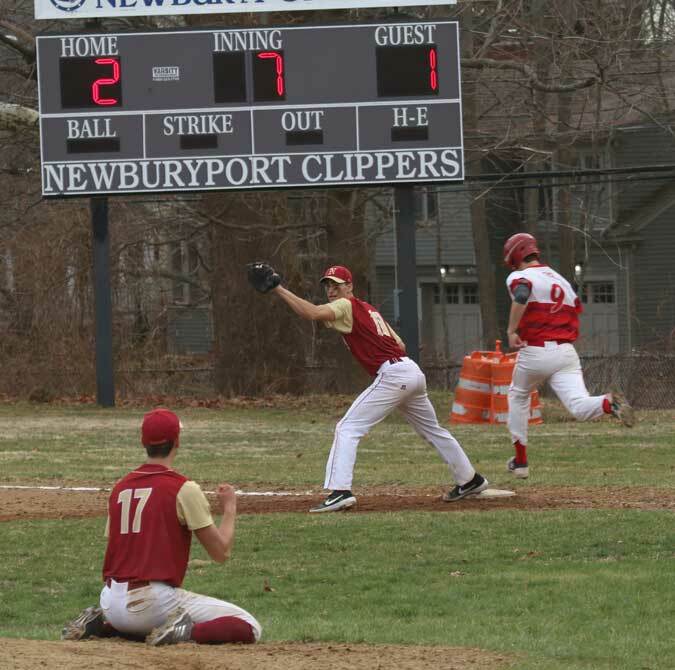 Triton defeated North Andover, 4-2, at home on Wednesday. How nice it was to spend a warm afternoon watching a game! Kylie Gilroy reaches 3B in the seventh as Shannon Beaton covers.